Received back the revisions and with the exception of the quotation marks going the wrong way, we are fine with it and we've ordered it. I didn't want to put it on here until Shayla saw it first. Shayla approves! I hope Christi does too! 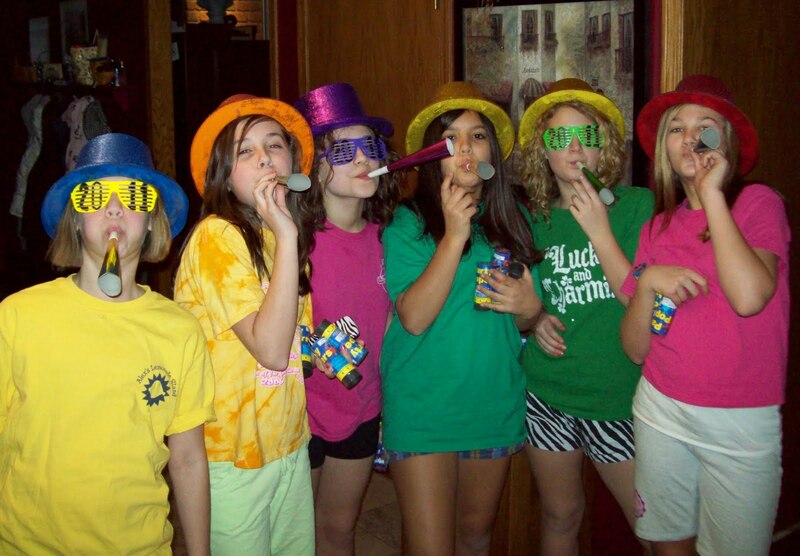 Shayla has been quite the busy young lady with activities and slumber parties. We snagged her this afternoon for a trip back to the Toledo Museum of Art for Japanese flute playing, amazing! 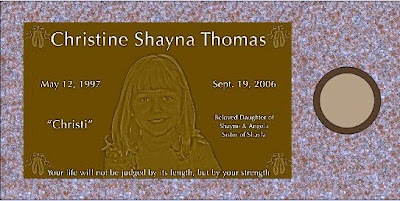 Shayla said the plaque was fine. We cried a little. I hope Christi would like it too. When I told the gentleman, who suggested pink, for the stone that Christi didn't like pink, but I thought it was perfect for a little girl - heck I used it for her whole "funeral color scheme" despite the fact a seven year old Shayla told me at the funeral home that Christi liked teal blue and Chrisi wouldn't like all this pink. The monument guy told me, "It can also be called Mountain Rose" so I said, "Yes, we'll go with that!" It's not pink, Christi, it's "Mountain Rose" and I love and miss you sooooooooo much, sweetpea! Weekly Update - all is well! Glassworks Class at the Toledo Museum of Art! All is well here! I hope you and yours had a great week too! 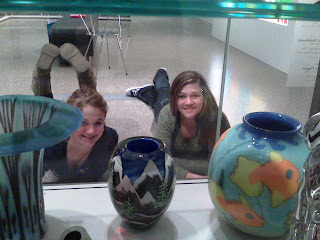 Shayla took a friend with her to the Toledo Museum of Art Friday night where they attended an amazing art class and we enjoyed watching glassblowing. Another friend joined her again on Saturday when we went to BGSU, caught a planetarium show at the university and then spent hours rearranging / fixing my "corner suite" in the Education Building. I believe I'm finally settled and I absolutely love my new office. Ahhhhh! PIC: Shayla with the glass instructor. 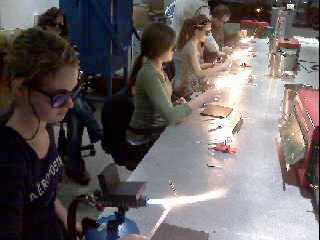 The girls did a fantastic job trying their craft of melting glass rods! It was amazing! And we only came away with one burn - Shayla's hand (because Shayne got involved trying to help her - oops!). She's fine! As the semester is now "up and running" again at BG, I think about my new students - a lot. 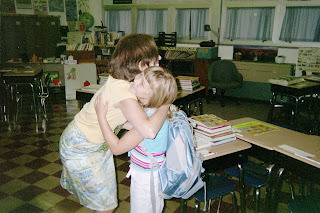 I hope and pray that they will be the wonderful, fabulous and absolutely amazing and compassionate teachers like Christi was so blessed to have with her 4th grade teacher (and Shayne's 4th grade teacher and later Shayla's 4th grade teacher) in Caroline. I love this picture of her welcoming Christi to school. What a great year she made it for Christi - and all of us! God bless her! 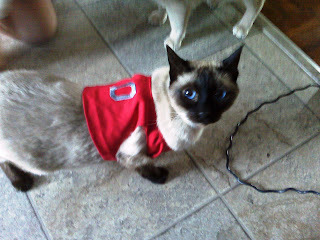 Shayla dressed Buckeye in an American Girl Doll outfit Christi's Chemo Angel made. GO BUCKS! 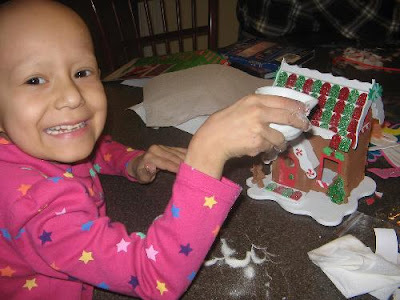 Since Christi's death in 2006, we've really not allowed ourselves to become close to other neuroblastoma families. We've shared information when asked, but have not followed others' journeys as we know the end result of this horrific childhood cancer. If you have NB stage IV and you are over 2 years old, you really don't have a chance of surviving. After having been down for so long, we knew this was a world we needed to walk away from and we have. It's just too painful for us. While I've tried not to get to close, due to a sweet friend, I've been following this awesome little gal's journey with NB - from California to New York City. Sadly, her battle ended this weekend. My thoughts and prayers are not just for her family, (gotta love teacher parents!) but also for all who have been supporting and loving her over the years. I know they are grieving too and my heart breaks for them. You'd think some progress would have been made in nueroblastoma survival rates since Christi was diagnosed in 2002. Unfortunately, that is not the case and the evil disease still robs so many family of their precious children. We enjoyed a lovely weekend! On Friday I received an email from my secretary telling me my new office was finished and I could move in any time now. I "IM"ed Shayne on my Blackberry who said, "You have many great qualities, but patience is not one of them. How about I move you in tomorrow morning?" Oh, gotta love that sweet man of mine! We spent MANY hours on Saturday at BG getting my new office arranged. 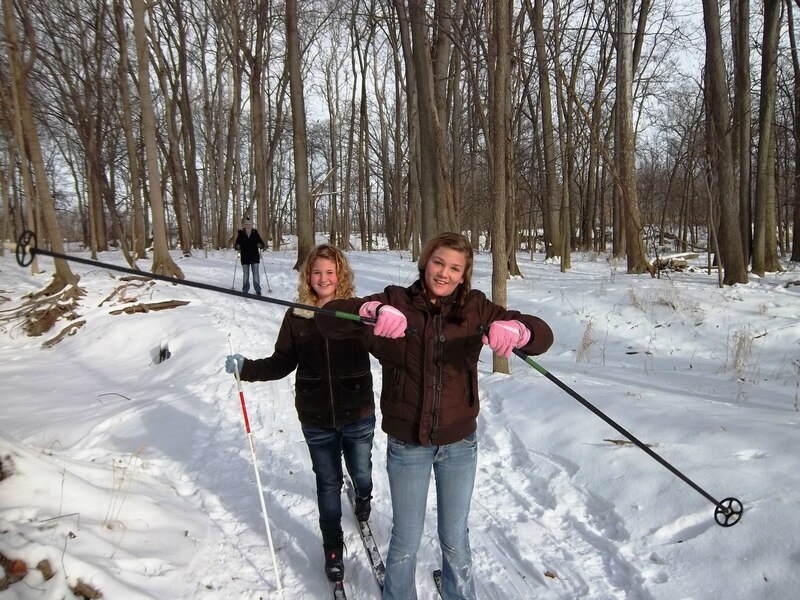 Shayla took a friend and they had a blast! Shayne not only moved my desks, book cases, and filing cabinets, but he also painted a bookcase for me so that all of my furniture matches. Shayla LOVES the view from out my new office window and I think, when I put the final touches on everything, it's going to be amazing. I didn't realize it was also bigger than my first office. Shayne calls it the "corner suite" - it's not THAT sweet, but really, really nice! I'm so blessed! And it was hard too. With most every pile I carried down the hall and over to the other offices, I had to pass a colleague's office. One who has been there longer than I and who probably feels should be getting the new office with the window. BGSU takes very seriously the "publish or perish" document you sign and also weighs in heavily those student evaluations of one's teaching and the service you provide (or don't). It's hard to believe in October I will be turning in those docs to see if I earn a second 3 year contract - or not. I've been working very hard getting ready my 2nd year review narratives, documents and portfolio evidence which are due at the end of the month (justifying my existence, hee hee). I'm sure I'm fine, (I've actually been called the "Poster Child for a new Professor" hee hee!) but time is flying and I really want to stay! I've never been happier or felt a job was a better fit for me than this one. At this time next year I will know whether I have earned a second 3 year contract or not. We were also able to squeeze in ice skating while on campus - what an amazing ice rink! Shayla also invited another friend over and we went cross country skiing on Sunday afternoon. Shayla overnighted with a friend last night and I'm being very productive today. Ahhhh! 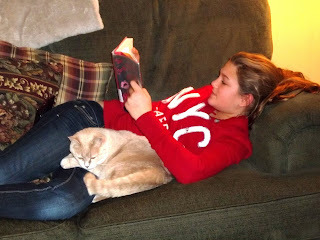 A sweet blogger recently asked about Christi's cats - Buckeye and Buttercup. Yes, they are alive and well! Shayla takes such great care of them; it's precious! 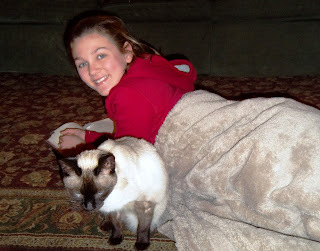 The Siamese literally "cries" when she's not here. She will go looking for Shayla - it's the cutest thing. I keep telling Buckeye, "The one who loves you is at school. It's just me here and I don't have time to play." New pic (very bottom) just for you, Lisa D., after reading your post. I head back to work tomorrow (and quite frankly I'm soooooo excited and truly can't wait!). Over the weekend, we went to visit our sweet friends, Eric (Webby) and Alicia. 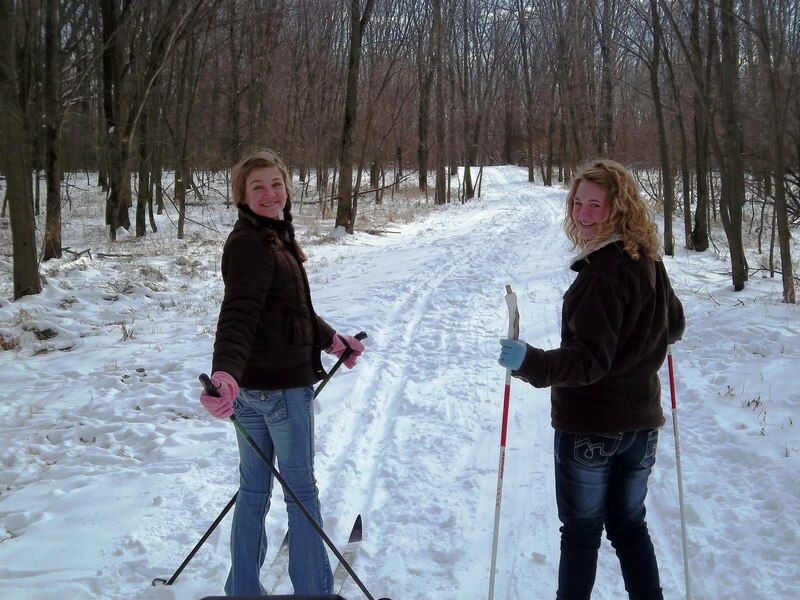 Shayla got a new bike, and got to enjoy both downhill and cross country skiing. She also enjoyed cooking with Mrs. Cook. Mom and dad - check out my new photos! I used some of your Christmas money to buy myself a new camera - THANK YOU! Of course notice that one of the Cook's sweet "Golden's" made it in this picture - just a bit. Shayla feel asleep cuddled up with Ryder last night, precious. This morning he work her up by jumping on her bed and licking her face - she loved it. 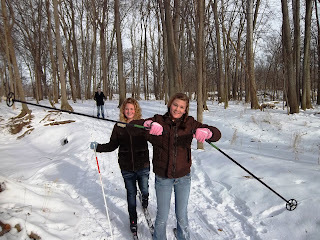 Each time she fell while cross country skiing, (which was often) Eric would say, "Go help her, Ryder!" and the doggie would go over and lick her face. She giggled and giggled and giggled! I’m now ready to begin the spring semester, one more week to wait though! At least I get to share my "Love of Literacy" with a HS and MS Faculty tomorrow for their "Wavier Day". I have some great sessions planned. I hope they learn a ton and enjoy it; I've absolutely loved my weekly work with their teachers and administrators this year! May your 2011 be filled with an abundance of happiness, peace and good health!